There has been a ‘Picture Shop’ in Hepworth’s Arcade, Silver Street, Hull, for over forty years, with Myton Gallery showing an eclectic collection of contemporary original artwork and limited edition prints for over ten of those. 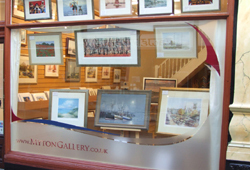 Myton Gallery is a truly independent art gallery, not tied to any publisher or organization. Where possible, I like to deal with the artists personally and I know the vast majority of them very well. I have to personally like the artwork in order to show the art in the gallery. The art on show is from both established, award winning artists, and exciting new talent. I have been a member of both the Fine Art Trade Guild (FATG) and the Federation of Small Businesses (FSB) for several years - Charlie Newham.